An iconoclastic frenzy has gripped parts of India in the last one week in the aftermath of the BJP's stunning victory in Tripura. 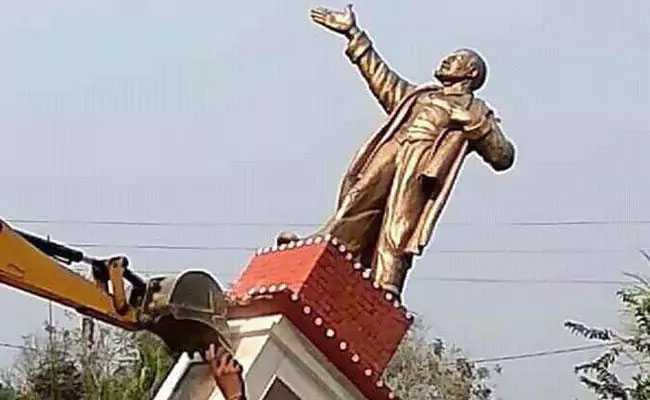 In an act reminiscent of statues of former Iraqi dictator Saddam Hussein being pulled off their pedestals by hysterical mobs following his overthrow, a big crowd in Tripura's Belonia town bulldozed a statue of Vladimir Ilyich Lenin, father of the Russian Revolution, after the CPI(M)'s 20-year rule was swept away by a saffron tsunami in the state polls. This statue, we are told was not a government-sponsored memorial to the icon of the 1917 Communist Revolution, but had apparently been built by local people, obviously with the help of CPM supporters. Whosoever may have constructed the monument, its destruction sent shock waves, particularly among the Left-Liberal intelligentsia. 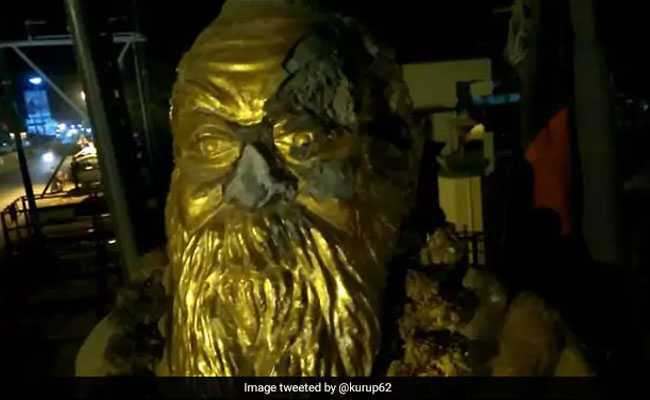 In a case of selective amnesia, critics of this act of vandalism in Tripura have barely mentioned similar actions of the ultra-Left in the past in West Bengal in particular where statues of Mahatma Gandhi and Swami Vivekananda used to be routinely disfigured in the 1960s and '70s. Some over-enthusiastic BJP leaders have not covered themselves with glory either; Tamil Nadu leader H Raja saying that Dravidian ideologue Ramaswamy Periyar's statue should be the next target invited a rebuke from none other than Prime Minister Narendra Modi. 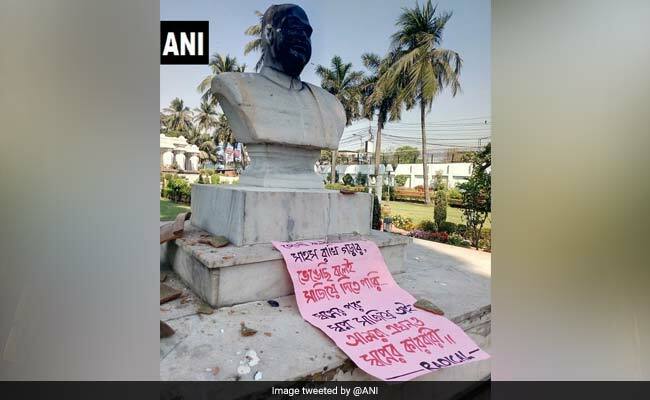 The frenzy gathered momentum lately when CPI(M) supporters apparently vandalized a statue of the erstwhile Jana Sangh's founder president Syama Prasad Mookerjee. Many, including those who do not endorse the uprooting of Lenin's statue, have argued that the act was a popular expression of mass anger against the CPM's "reign of terror" in Tripura over two decades during which hundreds were killed or maimed by the party's cadre - something that happened during Red rule in Bengal and is happening in Kerala even today. 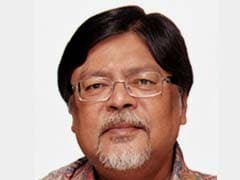 But Lenin's statue which adorns pride of place in a corner of the Kolkata Maidan, overlooking a busy thoroughfare that bears his name, was not uprooted when Mamata Banerjee's party ousted the CPM from power after 34 years in that state. In fact, Banerjee was quick to condemn the removal of the Communist leader's statue in Tripura despite her sharp ideological opposition to communism. Although mob fury against erstwhile rulers at the conclusion of a long stint of their rule is a natural way of expressing political jubilation, it is an undesirable way of attempting the erasure of history. Following the collapse of the Soviet state, statues of Lenin and Stalin were destroyed all across the erstwhile Soviet Union. Stalin in particular continues to be reviled the world over for the massacre of over a million people during his tyrannical rule. It is only in the CPM's offices in India that the Soviet dictator's posters still get prominent display. In that sense, Lenin was never regarded as a vile despot and instead respected as a formidable ideological icon. After his death in 1924, Stalin tried to obliterate even the contribution of his erudite former Comrade, Leon Trotsky, going so far as airbrushing Trotsky's photographs (obviously there was no photoshop application available in the pre-computer age), so that future generations did not regard him as a key builder of the Soviet system. Stalin eventually deployed his dreaded secret service to track down the self-exiled Trotsky to Mexico where he was killed using a pick axe. Although no tears were shed for the destruction of Hitler's statues in Germany and other parts of territories under Nazi occupation during World War II, it set the trend of demolishing memorials to late, unlamented leaders worldwide. Even Mao Zedong, now recognized for his brutality in massacring up to three million people in post-Revolution China, had his embalmed body removed from his mausoleum in Beijing in recent years. In other words, it has been part of Communist culture to erase memories of former rulers by new generation leaders in those countries. In India too, statues of former British rulers have been dislodged from their pedestals in Delhi and dumped in an unkempt park around North Delhi's Coronation Pillar Grounds. So the culture of statue-removal as part of rewriting history continues unabated. However, this form of violent iconoclasm is not natural to India's dominant Hindu culture. Many temples were razed by Muslim conquerors in this country and several spectacular Hindu idols desecrated in various temples. But iconoclasm is not endemic to the Hindu ethos as the faith is, broadly speaking, a tolerant and pluralistic one, assimilative rather than exclusivist, unlike Abrahamic faiths. Seen in this light, the toppling of Lenin's statue because his adherents have lost power in a state strikes a jarring note. Some amount of triumphalist exuberance was not unexpected after the demolition of the CPM edifice in Tripura. But this could have been expressed in other ways. Large-scale vandalism and physical attacks on CPM workers are reprehensible and do not form part of democratic discourse. Howsoever repressive the state's Communist rulers may have been, it must be remembered that they have been removed from power in a silent, non-violent way. That majesty of the Indian parliamentary system should have been respected by all, although in its heyday, CPM leaders openly denounced "bourgeois democracy" and quoted Lenin to claim parliaments were a "pig sty". But India as an aspiring Vishwa Guru has to show light to the rest of the world rather than emulate violent practices of other countries. Unless all political forces unite to condemn and curb the statue-breaking spree, latent caste fissures in our society might be laid bare once more. 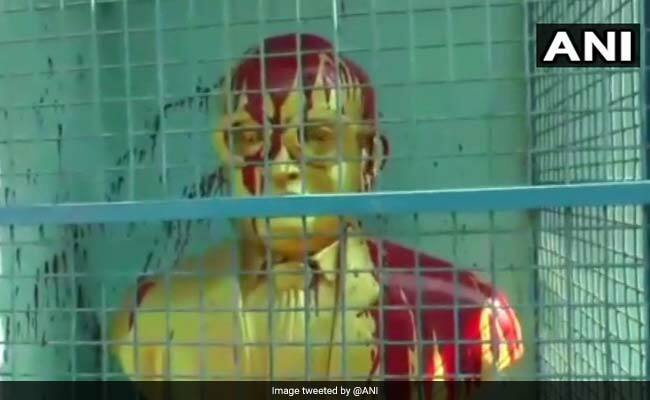 In any case, roadside statues of Babasaheb Ambedkar that adorn the entrance to Dalit hamlets across India are routinely defaced allegedly by arrogant members of the upper castes. Now that SP Mookerjee's statue has been desecrated in Bengal, it is quite possible that retaliatory actions may follow, with political miscreants seizing the opportunity to create social turmoil. Yeh bhi ek daur hai, woh bhi ek daur tha." For this is an age, just as that too was another epoch).